Let’s give customers pool water they’ll love. 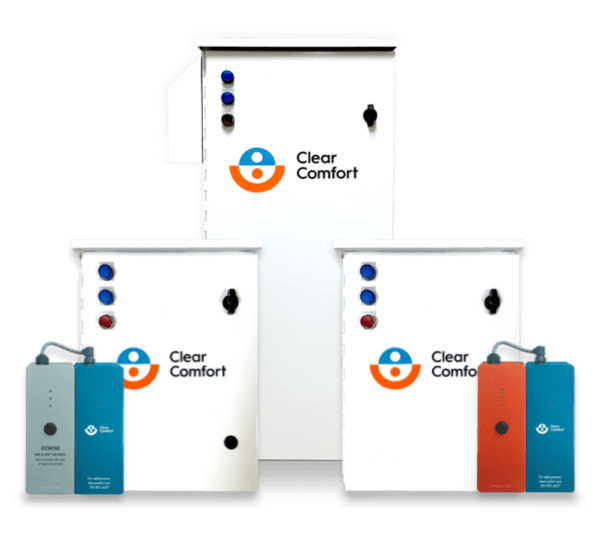 It’s time to give your customers complete sanitation without harmful effects of chlorine or salt with Clear Comfort’s hydroxyl-based advanced oxidation systems. Clear Comfort dealer partners have access to sales training, marketing materials and technical support. Best water quality: Silky-feeling water that’s kind to skin, eyes, hair, surfaces & equipment. Easy installation: Clear Comfort fits with existing pool pipes. Self-regulating: Simple maintenance with just one 5-minute annual cartridge replacement. Health conscious: Eliminate risk for allergies, asthma, rashes & other chlorine-related health issues. ANSI/NSF 50 | UL 1563| EPA Section 7 Act. Chemical savings: Reduce up to 50% of chlorine use & costs. Enhanced quality: Clean, soft-feeling water without chemical odor. Operational savings: Non-corrosive to equipment & uses less energy than UV. Supplemental sanitation: Proven to destroy 99.99% of Cryptosporidium. An award-winning industrial water technology that’s been patented for premium pool and spa water treatment. Keep up with customer demand and provide fresh-feeling, non-chlorine water they’ll love. All pool systems are protected with a 100% money-back guarantee for 90 days & a 5-year warranty. We help our partners with sales training, full customer support and custom marking opportunities. Clear Comfort runs successful pool treatment programs with some of the largest pool dealers, retailers service providers, and more in North America. In third-party testing, a recreation center in Estes Park, Colorado reduced its total chlorine use by 70 percent in six months using Clear Comfort. A YMCA swimming pool reduced the harmful disinfection byproduct haloacetic acid by 91.5 percent and trihalomethane by 84.8 percent, making it safer for staff and swimmers. An independent study with the University of Colorado at Boulder and the University of Washington found that Clear Comfort’s system achieves a 99.99+ percent inactivation of Cryptosporidium in less than 60 minutes. Ocean First, a dive shop and swim school, reduced chemical consumption by 50 percent, eliminated $500/year for UV bulb replacement costs, reduced a $200/month electricity cost to $15/month and lowered water waste by 50 percent. Rusty McFatter, owner of Rusty’s Pools in Jacksonville, Florida says he loves Clear Comfort because it leaves the pool fresh and odorless. Watch the video. If you’re a pool professional that wants to learn more about Clear Comfort’s non-chlorine pool technology – contact us today. To place an order or for technical support, email us or call us at 303.872.4477.